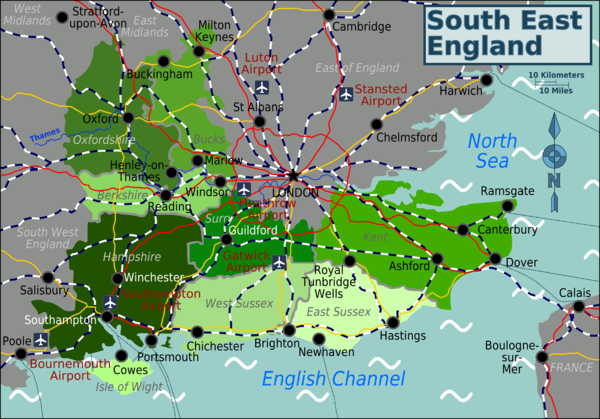 The South-East of England  is one of the most-visited regions of England and the United Kingdom, being situated around the English capital city of London and located closest to mainland Europe. Together with London, the South-East represents the main economic powerhouse of the country and is one of the most densely-populated of the English regions. The region holds much of interest to the traveller, from varied landscapes to historical towns and cities. Brighton (East Sussex) - Super trendy Brighton on the south coast boasts the best cultural events in the UK outside of London. Milton Keynes - gateway to the Midlands, New town architecture and home to Bletchley Park an important site in the history of computing. Note that although geographically within this region, London is actually a region in its own right. The Eurostar  runs from mainland Europe to Ebbsfleet, Ashford and St. Pancras Station in London. Services to and from the rest of the UK are good; with trains from the North through Buckinghamshire, Berkshire and Oxfordshire and from the West (and Wales) to Berkshire and the South Coast. The South's major passenger ports are Dover (Boulogne and Calais), Portsmouth (Cherbourg, Caen, Le Havre, St. Malo and Santander), Southampton (services to the Isle of Wight) and Newhaven (Dieppe). There are taxi firms everywhere (many are by booking only - find the phone number of the local company and phone ahead). Every town has a bus service, although these are - confusingly - privatised and you will need to make sure you contact the right company for information. This does mean that when you get away from the bigger towns bus services very often tend to be limited or non existent. The South-East has a very dense and usually easy-to-navigate road network. The M2, M3, M4, M20 and M23 motorways all connect the region radiating around London via the M25 peripheral road. Be aware that the M25 is nearly always busy, and there is congestion, sometimes severe, during the rush hours virtually every day. As well as the M25, the M20 (the main motorway link between Dover and London) is occasionally clogged up by lorries, often due to French ferry workers going on strike. (Operation Stack is the name to listen out for on the radio if travelling). Other motorways that can get very congested at rush-hour include the M3 (connecting Southampton to London) and the M27 around Southampton and connecting the city with Portsmouth. England has one of the highest densities of railway lines per square mile in the world, so rail travel is a very viable option...but much of it dates back to the early 20th century and as such there are frequent train delays and cancellations due to engineering works. Also, signalling equipment breaking has become a common occurrence in recent years, with passengers placing the blame on the 1990s Privatisation, in which less money has been spent maintaining the infrastructure as frequently as before when the railways were publicly owned. These costs are passed on to the customer - be prepared for the most expensive tickets in Europe (per mile/km). Be aware that the train lines in the South and South East are some of the busiest and most overcrowded in Britain, especially during the week day rush hours (7:00 to 9:00 and then 16:30 to 18:30). This is not only due to passenger numbers, but also train companies deciding to run the service on a shoestring, in which the trains are often too short for the most busiest routes. For example, the Ashford International to Brighton service is the most busiest, but only because its two carriages long when other less busy routes have at least four. Therefore, if possible and you are not prepared to stand for a long time, avoid this service and seek alternative routes. Also buy tickets before boarding the train to avoid risking a nasty shock. Some guards can sell you tickets on the train, but others can issue a penalty fare, which are known as Revenue Protection Officers. It is not made clear by the uniforms these wear, apart from a badge bearing their name and job position which is hard to see at the best of times and when they approach you asking for tickets, it's too late. If your originating station has no ticket facilities, the guard has to sell you a ticket on board regardless. If the station is closed and the ticket self-serve machines are not in order, you will need to purchase a "Permit to Travel" from a coin-operated machine if available, which you then exchange on the train for a ticket. This page was last edited on 28 June 2017, at 13:49.